We're close to wrapping up our series on drafting! We took a nice break to do a lot of actual sewing and now we're back! Today Jen will guide you into the world of commercial patterns, and teach you how to customize them to better fit you or the child for whom you're sewing. Neither Jen nor I use commercial patterns much, if at all, but we know how they work (or don't): the mystifying symbols, the seam allowances (why? why? ), the ostensibly "standard" fit, the undecipherable tables of measurements, the unknown (until you've turned them into a garment) ease...... oh wait, that's my inner whiner bleating. With a little bit of the right kind of information, though, commercial patterns are a very good starting point for garment-making. If you are lucky, you might have found a manufacturer or pattern company whose patterns fit you better than most with hardly any adjustment. If you have an especially unusual body shape, you might have given up on commercial patterns altogether. However, if you're like most of us, you've probably got a collection of working patterns from different sources, some of which need more work than others to fit. Want some help? adjusting different elements of the pattern design - necklines, hems, shoulder slopes and design fullness (like gathers). 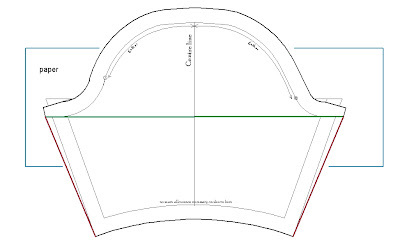 Now that you have a ready and wearable sloper / bodice block, you can adapt it to make any style of dresses, blouses and skirts, limited only by your imagination. If that task seems daunting to you, then use it to make commercial patterns fit your child as though you've drafted them yourself. 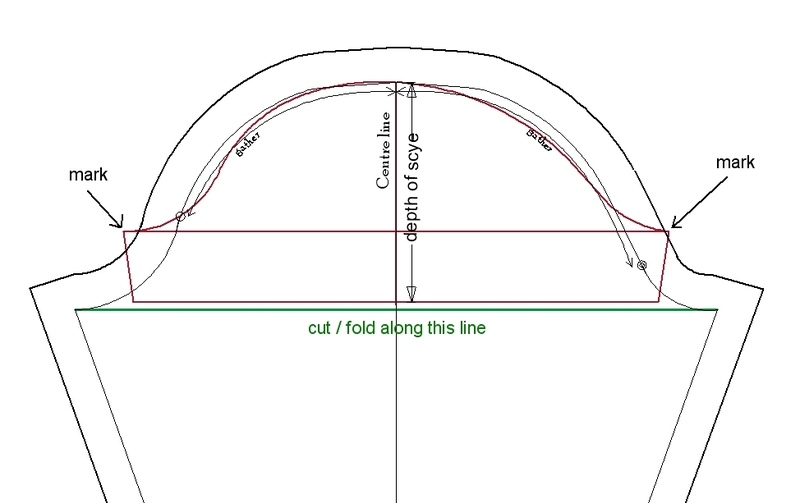 Hey you took the time and effort to create a good-fit sloper, so you may as well make the MOST of it. 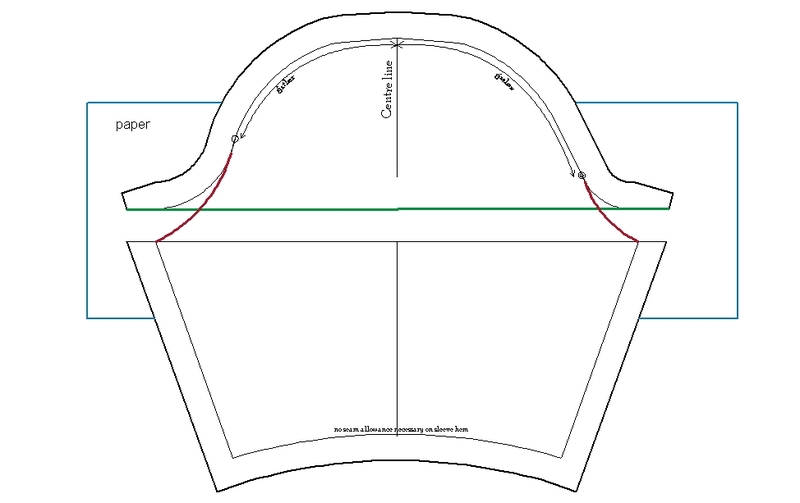 The first thing to do after purchasing your commercial pattern is to look at the back of the envelope or packet and study the sizing given there. If the pattern is for a dress in 2 pieces (ie. 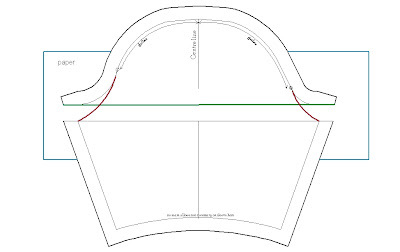 a bodice attached to a skirt) where the bodice stops at the chest level, then choose the size that is closest to the CHEST measurement of your child (not the sloper). This could be a little bit more or a little bit less than your child's actual chest measurement. 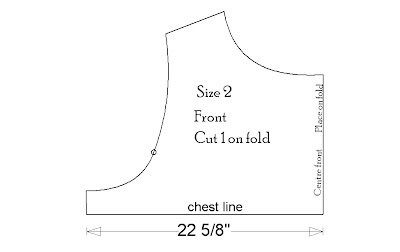 If the bodice stops at waist level, then choose the size that closest to the WAIST measurement of your child. Then take note of the given age defined for that size (2T, 3T, etc). Please ignore the possibility that the defined age is not the same as your child's real age. Write these numbers down somewhere on the back of the envelope so you will always have it on hand. The difference is the amount of ease built into the pattern. If you have included ease (e.g. 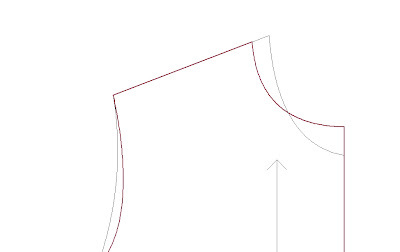 0.5") into your sloper (chest, waist, hip), take that much away from the ease calculated for the pattern. 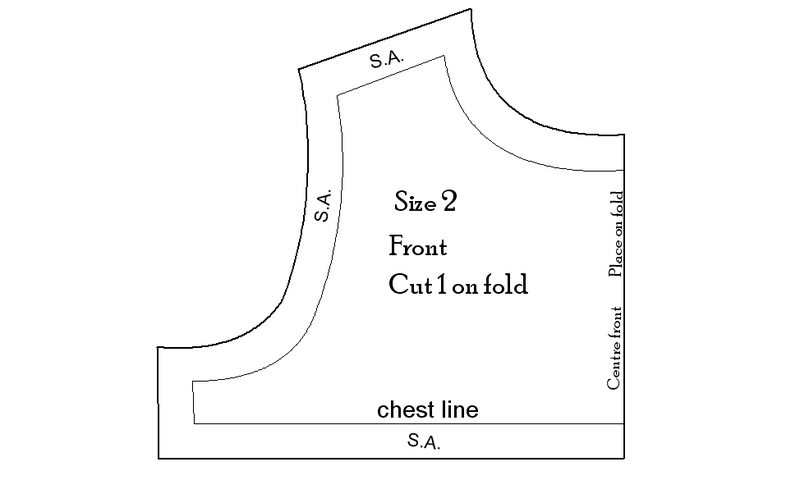 You must also know how much seam allowance (SA) has been added and built into the pattern. This amount is sometimes given on the back of the pattern envelope. 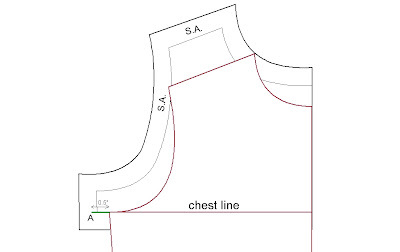 If not, you will have to measure the pattern itself across the chest or waist and get the difference between what you've measured and the finished measurement. The difference is the seam allowance built into the pattern. Next, look for the printed markings where the chest, waist, hip ought to be. Depending on the design of the garment, these markings may not always be marked. A-line, tent-type dresses tend not to have these markings. I will come back to that later and explain how to adjust accordingly. 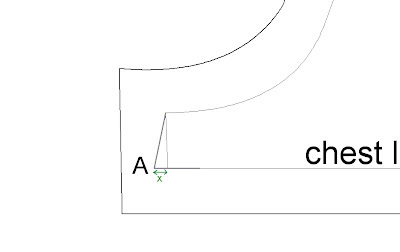 Determine the seam allowance in the commercial pattern as explained above. 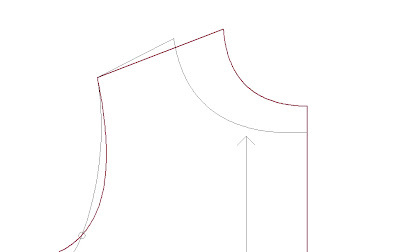 Place your sloper on the pattern matching the chest line, or waist line (this is dependent on the design of the dress) of the sloper and the pattern. 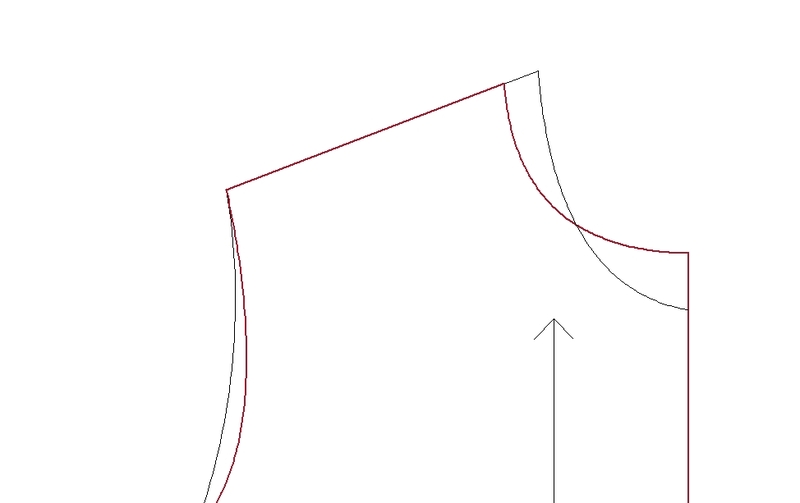 Trace out your sloper onto the pattern itself. 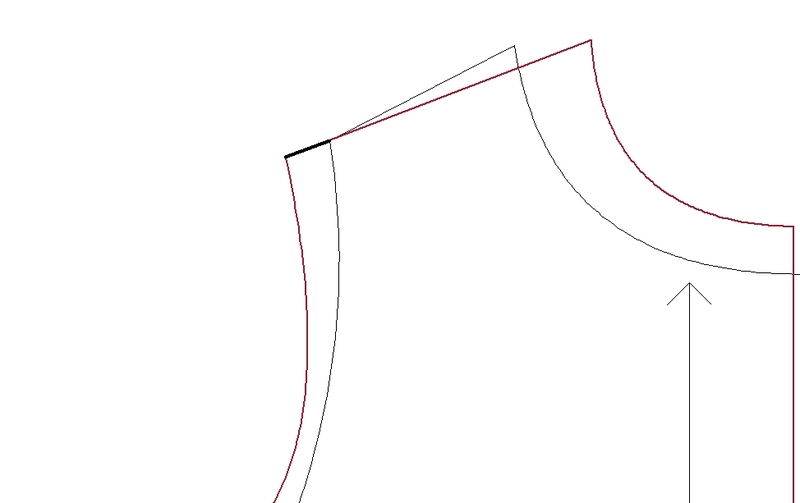 Take the sloper away after tracing. 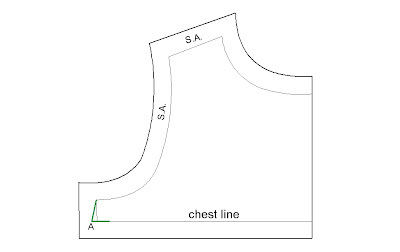 From the traced chest line (or waist line if you've used that) add in the amount of ease given for the chest (or waist) minus the ease from your own sloper (0.5" in the worked example above) and mark this with a point on the pattern. I will call this point (A) for reference later. 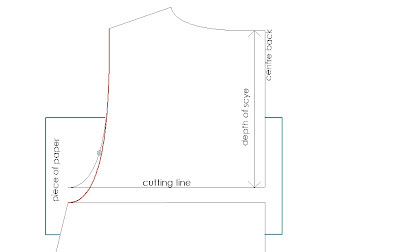 To lengthen: cut the pattern along this line. Place a piece of paper under the cut. 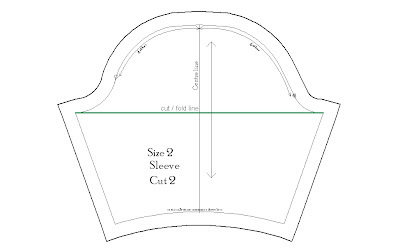 Spread the upper portion of the cut pattern until it matches the base of the armscye of the sloper. You will need to place your sloper over the pattern again to match this point. Once you are satisfied, tape the cut pieces onto the paper underneath. Redraw the scye smoothly. 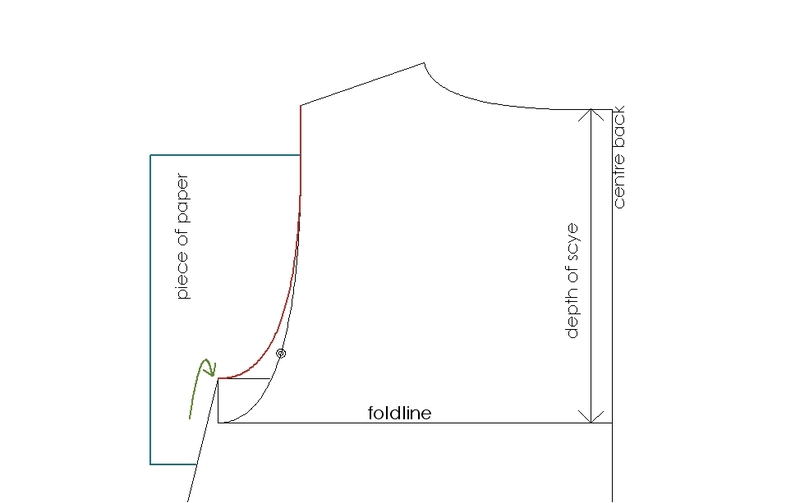 To shorten: crease the pattern along the drawn line and make a pleat according to the amount to decrease. Place the sloper over to check. 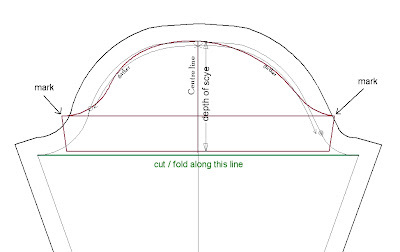 Tape the pleat down and redraw the scye smoothly. 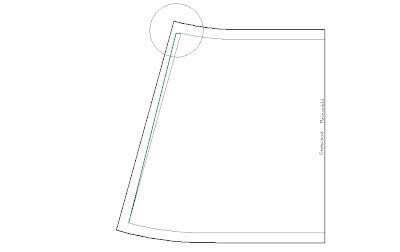 the skirt portion of the skirt will start from either the chest or waist line (design dependent). You would already have adjusted the pattern at the upper torso according to either one, as explained previously. 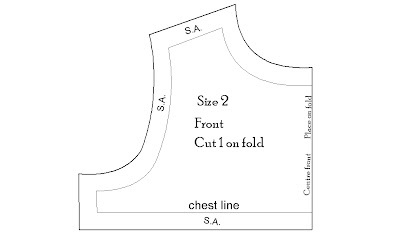 Adjust the waist (chest) of the skirt like so: A-line / gathered / pleated skirt - on the upper torso piece, measure from point A to the original chest/waist point of the pattern. Let this amount be X.
subtract if you had to decrease the chest/waist line in the upper torso. 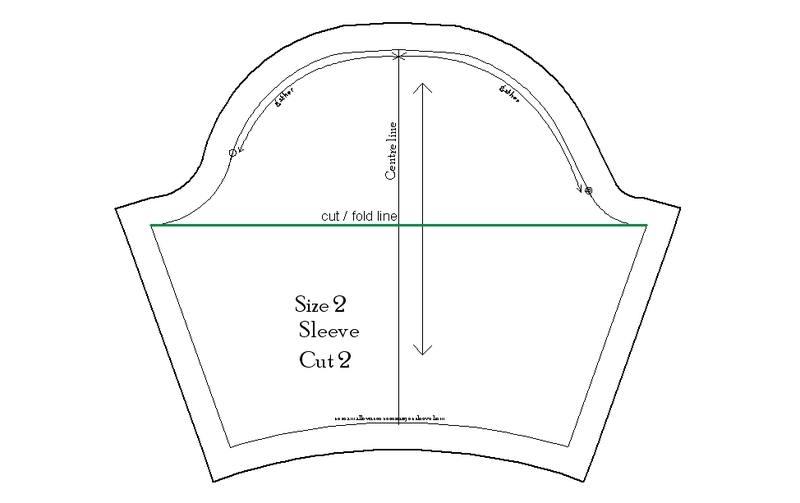 because sleeves can vary in style, I will only explain how to adjust the depth of scye of the sleeve, which in most cases is sufficient to ensure a nice-fitting sleeve. 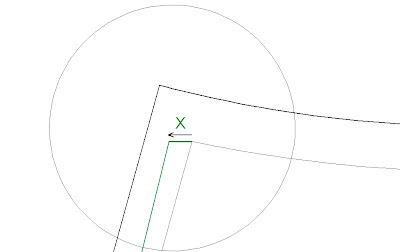 On the commercial pattern, draw a line to join the 2 points marking the base of the armscye. 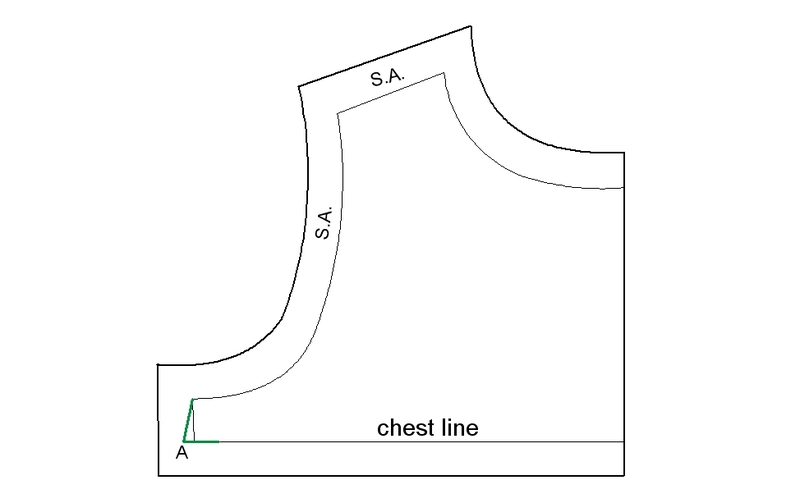 1 Shoulder slope - some shoulders are slopier or blockier than the 'standard' (whatever that is). Place your sloper over the pattern, matching at the shoulder points*. Make sure the pattern is aligned vertically as well. 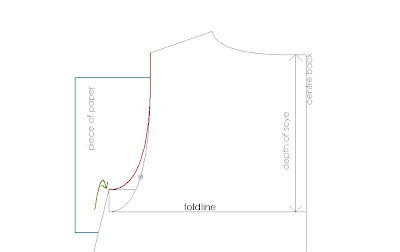 If there is a significant difference between the slope on your sloper and that of the commercial pattern, then trace your shoulder slope onto the pattern paper. Smooth out the neckline if necessary. If the difference is negligible, then don't bother adjusting, really. 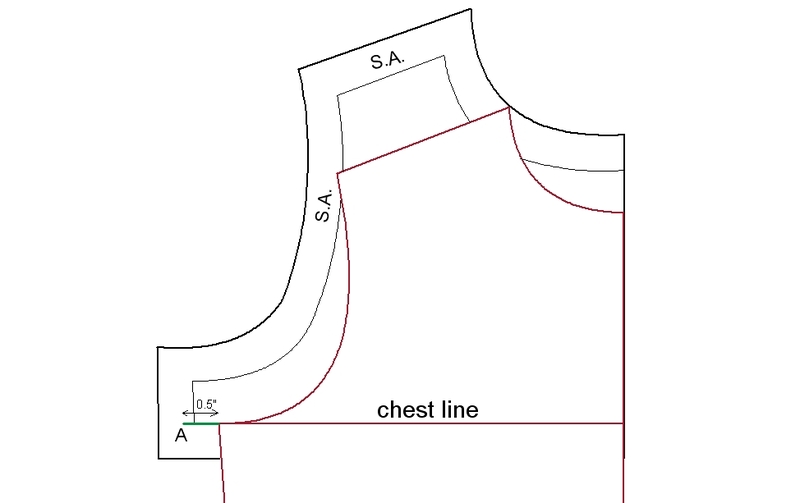 *remember that on a sleeveless pattern, the shoulder point should sit higher on the shoulder line (see here for more explanation). 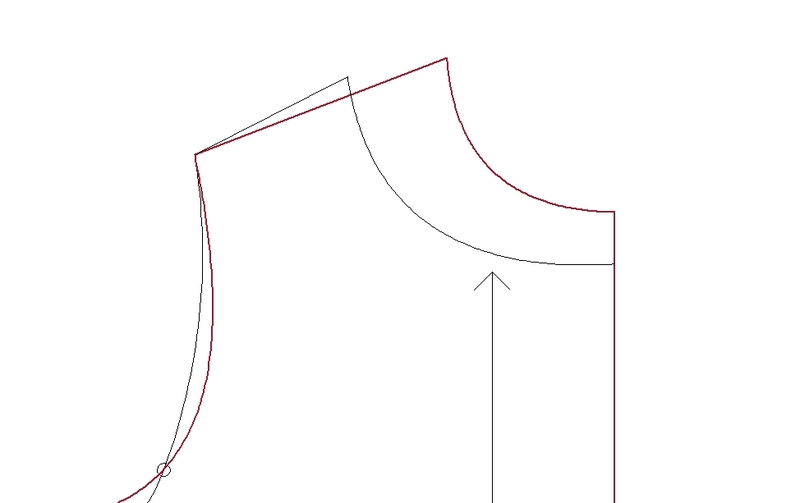 For a sleeveless pattern, mark a point about 3/8" (1 cm) in from the original point. Use this new point as the reference when adjusting the shoulder slope. 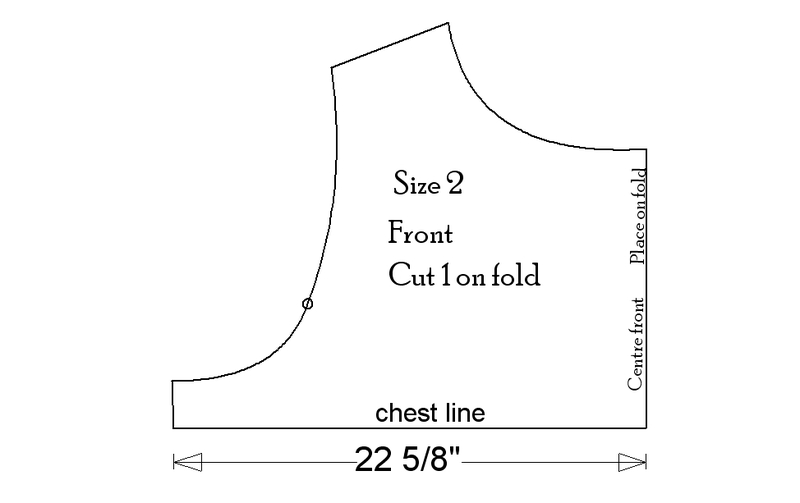 2 Neckline - your sloper might have a wider / lower neckline than the one on the pattern. To adjust the neckline, place your sloper onto the pattern , matching along the centre line and the shoulder point as much as possible. 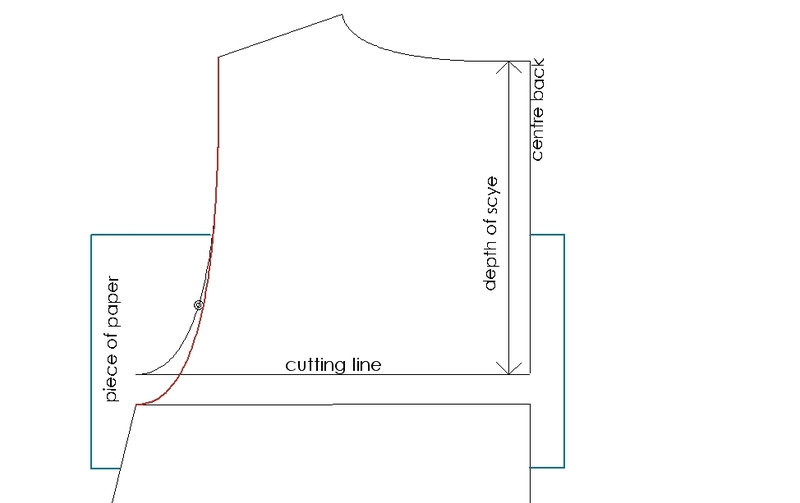 Trace the sloper neckline onto the pattern paper. 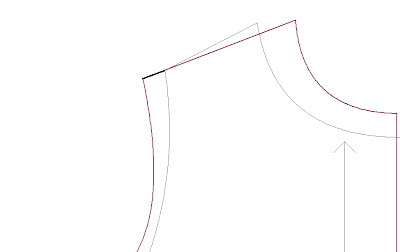 Redraw the pattern neckline to match the shoulder point at the base of the neck. 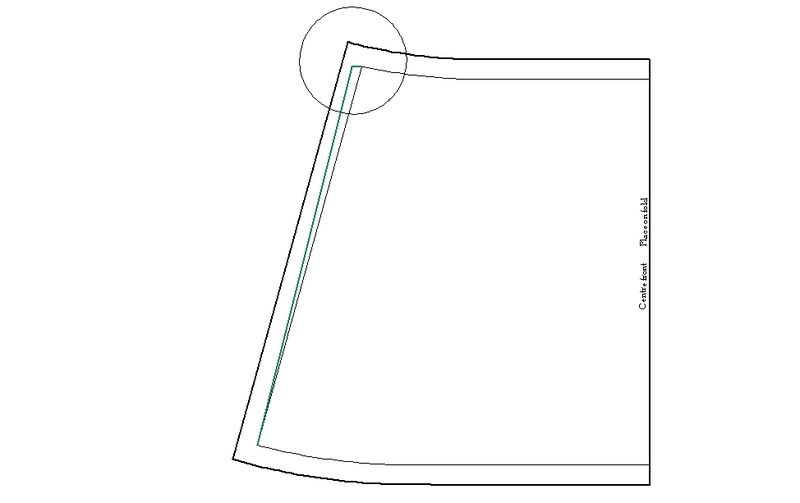 3 Sheath / Skirt length - this is a no brainer, really. Just lengthen or shorten at the hem. All the adjustments taken above are required for both Front and Back pieces. Adjustments are not necessary for embellishments like sashes, lace trims, binding, because you will only need to increase the amount required by a little bit. Fabric yardage can remain the same as well because the pattern writers tend to state more than is usually required. I hope this provides you with the verve to go out and alter all the commercial patterns in your collection. If you are anything like me, quite a few were really ill-advised, I bet! LiEr back again: Told you she was good! Yes, there is hope for all the children of the world who are between sizes, taller than average, huskier than average - which is most of them. 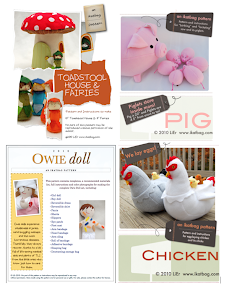 Even I want to go out and buy a pattern just to play around with my slopers! The good news about children's patterns is that they are easy to alter and customize to your small person's unique dimensions. 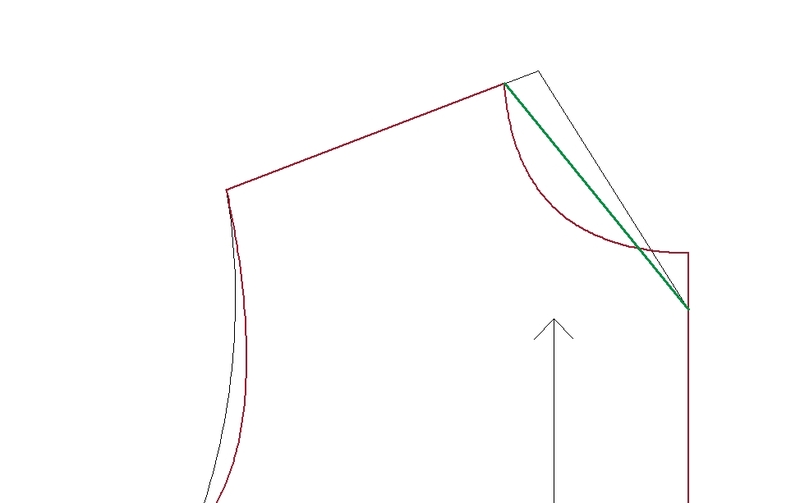 The principles are the same - you match the reference lines of your sloper to those of the pattern. Often, as Jen says, this means you pick the most defining reference line for that kind of garment (e.g. the bust), and adjust the others on the pattern (e.g. 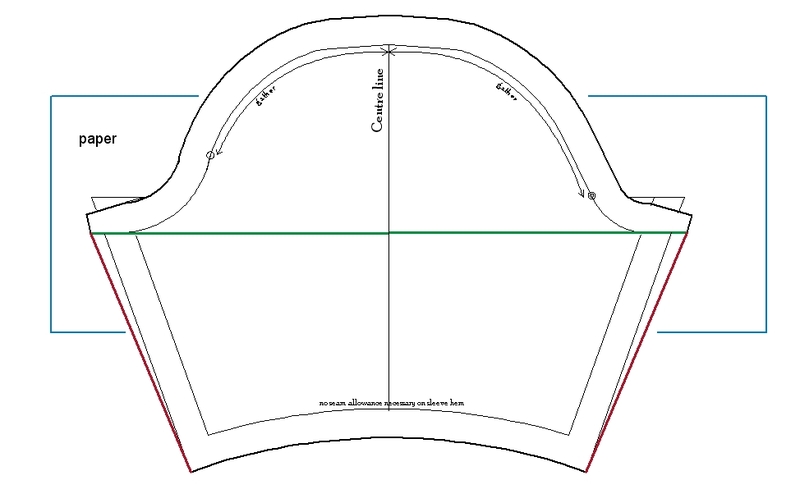 the waist, the shoulder point, the hip etc) to match your sloper. 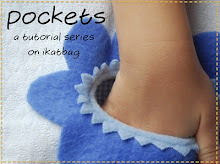 There are darts in an adult female pattern, too, so you'll be adjusting those as well. And then, make a muslin and try it out! Next up: A wrap-up, a summary and a giveaway! Well hurrah for European patterns, then! I suppose if a person grows up being exposed to inbuilt seam allowances, they get used to always having them, just as I have gotten used to not seeing/having/using them. To each his/her own, I guess. Just not mine. I agree about seam allowances! When I first started sewing, I only used patterns that had them built in and it was inconceivable that I'd ever want a pattern without them. But once I started using some Burda patterns and creating my own patterns, I got used to the flexibility of adding my own allowances. Hi thanks for all these wonderful tutes on drafting etc. Up until I read your blog drafting princess seams had mystified me. Now you go a wonderful step further and teach me how to use my sloper to fit commercial patterns. Finally I will get some value out of my pattern collection! 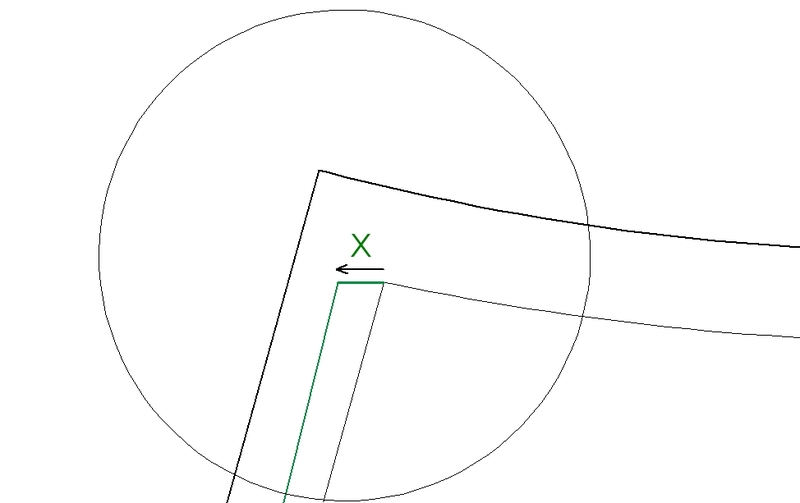 1 - 0.5 = 0.5"
But then later the example has 0.5 inches added to the half of the front, which would mean really adding 1 inch to the front, and presumably another inch to the back. Shouldn't the ease be divided up between those 4, so 0.125 inches to each quarter of the garment?